There has been a growing demand for automotive compact camera module, particularly in commercial vehicles since the recent past. Automobile manufacturers are emphasizing on adoption of compact camera module as a replacement for rear & side view mirrors, which in turn is anticipated to create new growth opportunities for the automotive compact camera module market globally in the foreseeable future. With slowdown in the economic expansion globally, many industrial sectors have suffered stagnancy, and the automotive camera industry has been no exception. However, a relatively optimistic growth has been maintained by the automotive camera industry over the past few years. Mounting requirement for sensing compact camera modules that seek huge application in the ADAS, in tandem with rising concentration on the safety measures attributed to growing number of road mishaps will propel the market growth. Substantial evolution has been observed in the automotive compact camera modules, leading toward their integration with the safety systems. A great example of this is the video camera technology being leveraged by lane departure system, provided with an electrically-powered steering system, for faster feedbacks in crucial conditions such as swaying of vehicles from the active lane. Compact camera modules are being increasingly employed in various vehicles for a wide array of applications, particularly in passenger cars. The compact camera modules, installed in rear, front & inside of automobiles, deliver safety to passengers, along with imparting enhanced driving experience through improved rear & front view of the driver. Automotive systems based on the compact camera module technology have undergone enormous developments since the recent past, coupled with acceleration in the sales of automotive compact camera modules for application in parking surround view. Rising advancements in automotive compact camera modules in parallel to rapid production rate has resulted into declined prices of these cameras, thereby propelling their adoption. According to Transparency Market Research, global market for automotive compact camera module will reflect an impressive expansion through the forecast period, 2017 to 2026. Worldwide sales of automotive compact camera module will surpass US$ 4,500 Mn in revenues by 2026-end. Rapid growth in economic vigour of countries in Asia-Pacific excluding Japan (APEJ), including China, South Korea, and India, has enabled consumers in the region to spend more on vehicles and their additional features. Demand for passenger vehicles and luxury vehicles in particular has witness a significant surge in countries of APEJ. These factors have made the region to become the largest market for automotive compact camera modules. APEJ will continue to be the fastest expanding market for automotive compact camera module. In Europe, expansion of the automotive compact camera module is mainly driven by rising production volumes of LCVs, impact of New Car Assessment Program (NCAP), and stringency in EC regulations. European vehicle owners demand for advanced driver assistance systems including lane departure warning systems and parking assistance systems. Europe is therefore slated to be the second most lucrative market for automotive compact camera module by 2026-end. OEMs and automotive compact camera module manufacturers are entering into collaborations as well as increasing their investments in the development of novel & technologically-advanced compact camera modules for vehicles. Several OEMs have also been exploring safety solutions continuously wherein compact camera modules find large application. Popularity of wide angle lens is being capitalized on by automotive compact camera module manufacturers for gaining a competitive edge. Key market players tracked by the report include Automotive Compact Camera, Ability Opto, AGC, Continental AG, Huawei, Volvo, Mobileye, Xiaomi, Toshiba, and BYD Microelectronics. Automotive compact camera module forms an integral part of the automated driving, advanced driver assistance system and automotive electronics. These cameras have been immensely benefitted from the infrastructure left behind by the digital still camera manufacturers, coupled with the developed know-how of compact camera modules designed for mobile phones, a direct consequence being dramatic decline in the average selling prices (ASP). Manufacturing methods adopted for automotive compact camera modules hold potential maturity, in terms of technology. With standardization intensifying competition between manufacturers, a large number of players are implementing novel strategies to gain a competitive edge in the market. A new report by Transparency Market Research analyzes current and future conditions of the global automotive compact camera module market. The report encompasses all major trends as well as technologies that significantly influence growth of the market, meanwhile highlighting imperative drivers, restraints, threats and opportunities that will impact the market expansion in the upcoming years. The report also offers a holistic perspective on value of the global automotive compact camera module market in US$ Mn, in terms of revenue. The first chapter of the report issues an executive summary of the global automotive compact camera module market, providing a précis of the market incorporated with crucial and relevant numbers such as CAGRs for the historical period (2012-2016) & forecast period (2017-2026). A quick introduction to analysis and forecast on all the market segments included in the report has been offered in the executive summary. A chapter titled “overview” trails the executive summary, comprising a concise introduction of the market succeeded by a formal definition of “Automotive Compact Camera Module”. Clear picture of the market’s wide scope has been portrayed in the overview. Chapters trailing the overview illuminate key dynamics impacting demand for automotive compact camera module globally, while inundating detailed insights with regard to bottom line of enterprises, the global economy and the fiscal stimulus. A segmentation analysis incorporated in the report’s following chapter propounds forecasts on the global automotive compact camera module market. The market has been categorized on the basis of application, vehicle type, pixel size, and region. Study on the market share comparison, Y-o-Y growth comparison, and revenue comparison along with relevant market number has been offered in this chapter. 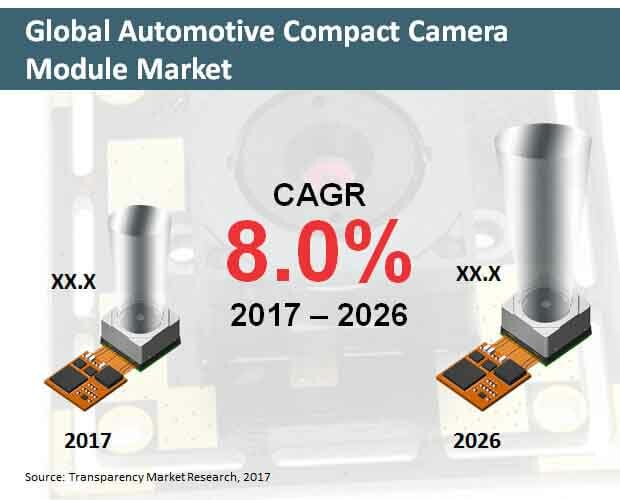 The global market for automotive compact camera module has been regionally segmented into Middle East & Africa, Japan, Asia-Pacific excluding Japan, Europe, Latin America, and North America. A scrupulous analysis on the competitive landscape of the global automotive compact camera module market follows the market’s segmentation analysis. This chapter profiles key market players in detail, providing analysis on them in terms of SWOT analysis, key financials, key developments, product overview, and company overview. Occupancy of the market players has been depicted in this chapter through an intensity map. This chapter is priceless for report readers as it enabled them in making correct and effective business decisions.